The VRX932LAP is a powered, lightweight, compact, 12", two-way line-array speaker system designed for use in arrays of up to five units. VRX932LAP is the ideal choice when line-array performance is needed but the venue size doesn't call for the very long-throw characteristics of larger line-arrays. It's also a wise choice when fast-and-easy setup is vital. The VRX waveguide mounts three compression drivers on a continuous arc enabling them to work together as though they were a single driver. Power handling is dramatically increased and when multiple enclosures are used together in an array they work together seamlessly as if they were a single driver on a very long waveguide. The result: unprecedented coherence projecting the sound energy directly to the audience and stunning, clear high-frequency sound quality regardless of the configuration. No matter how many enclosures in a VRX array the horizontal coverageis a constant 100. Rather than stacking and arraying systems side-by-side and running the risk of an inconsistent sound field as the coverage patterns overlap, with the VRX, the array is built vertically, and sound is projected from a single waveguide. With no overlapping coverage patterns, not only is the sound filed extremely consistent, a great stereo image is guaranteed too. The Array Shading Configuration selector enables an array to be fine-tuned for an even more consistent sound field. Each high-frequency section in an array can be boosted or cut. For example, the upper enclosures in an array can be boosted to project the high frequencies to the back of the venue, while the lower enclosures can be cut, "shaded" back for less output for the front rows of the venue. Ease of set up and takedown is critical to ensuring high quality sound reinforcement that meets both time and cost restrictions. JBL's exclusive integral rigging hardware for the VRX900's allows the enclosures to be quickly and securely locked to one another by simply swinging a hinged bar into place and securing it with the included quick release pins. 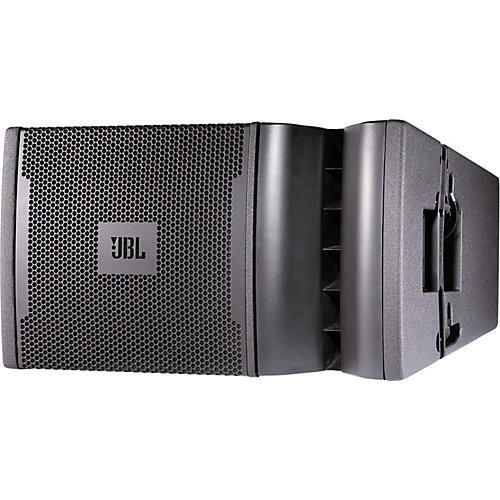 VRX uses JBL's Differential Drive woofers with dual voice-coils and neodymium magnets. Neodymium's magnetic properties allow a few ounces to replace pounds of conventional magnetic material. In the Differential Driveconfiguration the magnet is positioned inside the two voice coils making traditional big steel pole plates redundant, further decreasing the size and weight of the driver. The use of neodymium and the dual voice coil design delivers a very lightweight driver with massive amounts of power capacity,low distortion and reduced power compression. DBT (Dual Bridged Technology) directly links discrete amplifier channel outputs with each voice-coil in the Differential Drive Woofer, transferring the maximum amount of power in the most efficient way and improving the speakers overall performance. The setup for VRX900 powered speakers is fast and easy. Simply connect up to three loudspeakers together by looping the power and audio cables from one unit to another.